Eight persons – Navya, Farukh, Ankur, Mangal, Ravan, Danav, Simar, and Gopal are seated around a circular table such that only three of them are facing away from the centre and the rest are facing towards the centre (not necessarily in the same order). Navya sits second to the left of Ankur. Farukh is not an immediate neighbour of both Ankur and Navya. One of the immediate neighbours of Ankur faces opposite direction of Ankur. Gopal sits third to the left of Navya. Danav sits second to the left of Gopal. Mangal is not an immediate neighbour of Farukh. Simar sits third to the left of Mangal. Ravan and Farukh face the same direction as Mangal faces. Farukh doesn’t sit opposite to both Ankur and Navya. Who among the following sits second to the right of Danav? Following the final solution we can say that Mangal sits second to the right of Danav. We will keep this information in mind while solving the puzzle. Navya sits second to the left of Ankur. Farukh is not an immediate neighbour of both Ankur and Navya. Farukh doesn’t sit opposite to both Ankur and Navya. Here, we have two possible scenarios in which we can use the above information accordingly. Gopal sits third to the left of Navya. Danav sits second to the left of Gopal. One of the immediate neighbours of Ankur faces opposite direction of Ankur. Mangal is not an immediate neighbour of Farukh. Simar sits third to the left of Mangal. Ravan and Farukh face the same direction as Mangal faces. At this point we cannot fix the position of Ravan and Farukh facing same direction as Mangal in case 2 according to the given hints so we can say that case 2 is an invalid case. Who among the sits in front of Ravan? Following the final solution we can say that Ankur sits in front of Ravan. Hence, the correct answer is option D.
If the all persons are made to according to their names appear in dictionary in clockwise direction starting from Ankur then position of how many person(s) will remain unchanged including Ankur? Here, we can see that position of two persons is unchanged including Ankur. Hence, the correct answer is option B. Who among the following sits third to the left of Simar? Following the final solution we can say that Mangal sits third to the left of Simar. Hence, the correct answer is option A. How many person(s) sit between Ravan and Navya when counted from the right of Navya? Following the final solution we can say that only one person sit between Ravan and Navya when counted from the right of Navya. Seating Arrangement is one of the topics that forms the base of any bank examination. Be it SBI PO or IBPS PO, IBPS Clerk or SBI Clerk, RRB Office Assistant or RRB Officer Scale I, RBI Grade B or IBPS SO. Not just in bank exams, but Insurance sector exams also feature questions on seating arrangement. Seating arrangement questions are commonly seen in exams like NIACL Assistant Pre, NIACL Assistant Mains, LIC HFL, UIIC etc. At this page, you will get all the questions based on new pattern seating arrangement that has been asked in several exams like SBI Clerk Mains 2018, SBI PO Mains 2018 and RRB Office Assistant Mains 2018. Seating arrangement questions are completely based on verbal reasoning where questions are solved by applying verbal statements in a logical order. You can find new pattern seating arrangement questions with solutions that can help you to derive at the answer quickly. The unmatched explanations will help the aspirants to build their concepts. In seating arrangement questions the most important point is to build a strategy for which the given information is to be utilized in a logical manner. It is very important to use the direct hints first and then put up the other information. After placing the direct hints, use the information connected with the direct hints to get the answer. This strategy will help to reach the answer in fastest possible time, which is the key to crack a competitive exam. In SBI Clerk Mains 2018, the major portion of the reasoning section was occupied with seating arrangements. There were almost all types of seating arrangement questions like Linear seating arrangement, Circular seating arrangement, Floor based seating arrangement and Rectangular seating arrangement. So, this itself tells the importance of Seating arrangement questions in upcoming bank exams, insurance exams and even CLAT 2019. 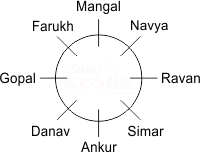 Practice one test daily at www.smartkeeda.com to achieve excellence and master the critical topic of reasoning i.e. Seating Arrangement. Here, you will get linear seating arrangement questions, circular seating arrangement questions, floor based seating arrangement and rectangular based seating arrangement questions with detailed solutions. Take one quiz daily to build a strong command over all types of seating arrangement questions because in today’s competition age it is essential to have good command over all the four sections that come in bank exams. Start your preparation with the most relevant questions at www.smartkeeda.com and don’t forget to attempt test series on SBI PO Pre+Mains, SBI Clerk Pre+Mains and IBPS PO Pre+Mains, IBPS Clerk Pre+Mains available at testzone.